I'm on the fence about this one. I'm leaning towards really loving it, but there is something a little off about it. And yes, this is most definitely a sack dress. No waist definition at all. I really dig the way sack dresses look... on other people. I've tried making them from time to time and have never felt like they suited me. However. I honesty don't really care that this dress is not one that is considered traditionally flattering. I like it. There is something not quite right about the proportions, though. I used Vogue 9022. I'm not really sure what drew me to the pattern. I thought the pockets were cool. 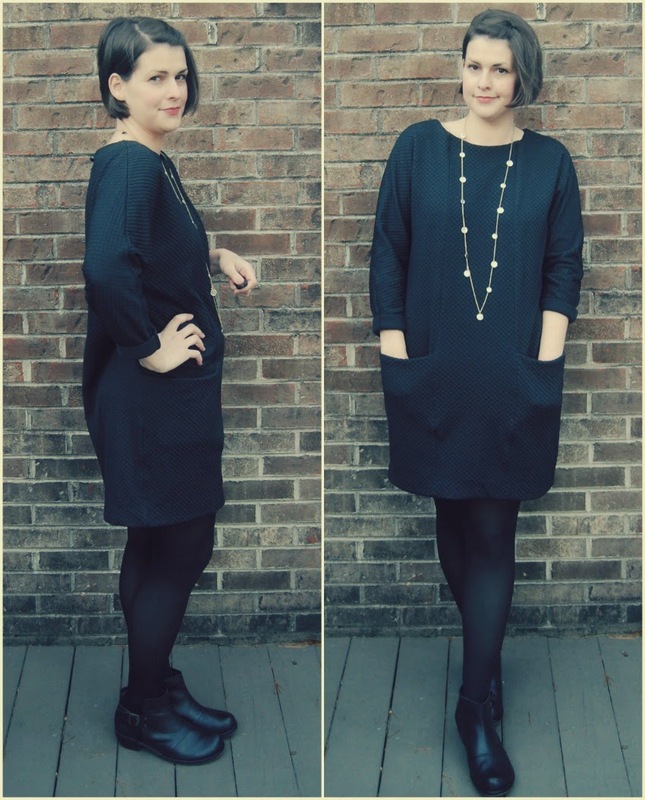 And I liked the dolman sleeve. The suggested fabrics list different wovens along with ponte. I figured I could make it out of something stretchier than ponte, which I did. I used a really cool textured knit of questionable content I found at Joann's. This particular knit has a lattice texture and is very stretchy. You can see the texture really well in that heavily edited photo below. 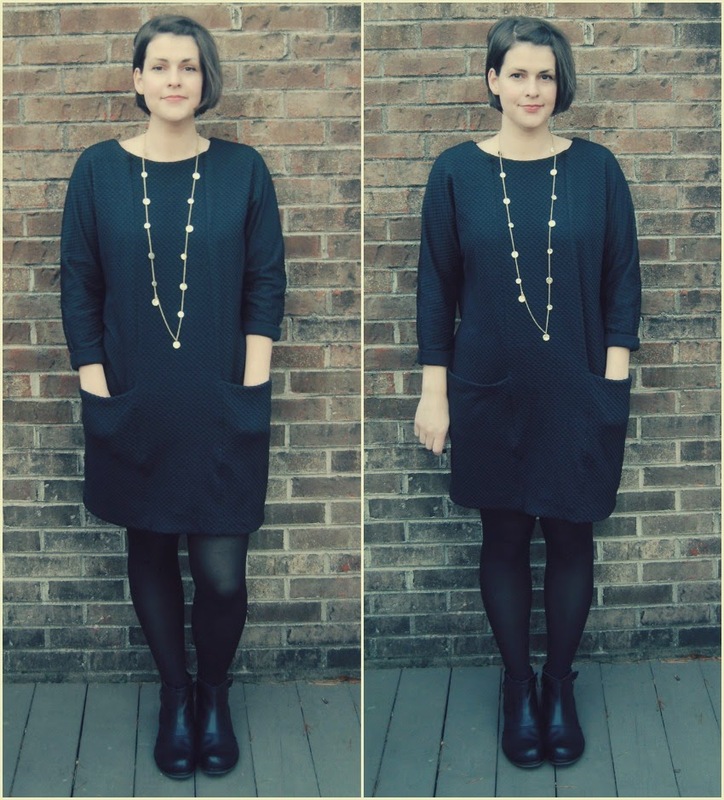 I was worried that it was too thin for a dress so I underlined it with a black cotton knit. I searched for one that had the same amount of spandex as the textured knit. But there are some issues with having the two knits together. The cotton knit is really grabby which makes some odd wrinkles show up while I'm wearing this dress. I can smooth them out, though. And the two layers together make this dress extremely thick. 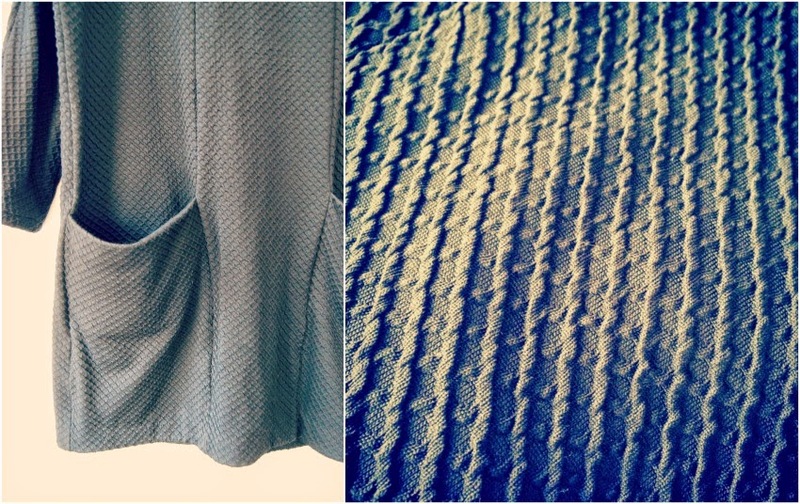 There is some seam rippling as a result of all the thickness, especially where the pockets are doubled over. 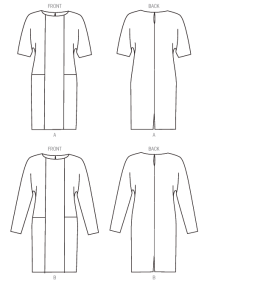 The pattern has a separate pattern piece for the lower pocket with a seam at the bottom. After reading a pattern review about it, I decided to eliminate that seam and cut out the side front pieces in one giant piece. That was an interesting pattern piece. I'm not sure that it was a necessary move as a seam at the bottom of the pocket "bag" wouldn't have made a difference to me. My measurements put me as a size large and that is what I cut, ignoring my instinct to go smaller since I was using a stretchier knit. I should have cut a medium, maybe even a small. Ok, well probably not a small. I can't remember the last time I ever wore a size small. It was huge when I basted everything together. I think I ended up sewing all of my seams at an inch or more. For real. I cut the long sleeves and they were so long it was comical. And I have long arms. I took four inches off the sleeve hems and I still prefer them rolled up a little shorter. I took two inches from the pattern shorten line before cutting my fabric. I knew I wanted the dress to be short to balance out the ease. Then I ended up hemming it up two more inches. So four inches off the hem, four inches off the sleeves and I'm guessing about four inches around. Over sized pattern? I'd say so. I did sew the keyhole at the back because I like the way keyholes look. But it isn't functional. I sewed up the hem split because it was indecently high after taking out all the length. Anyway, I'm liking the end result. I think I need to wear it out once before I can really make a final judgement. I don't think I'd revisit the pattern, though. Maybe the pattern would work better in a woven.